This is one of my favourite ways to enjoy a warm beverage in the morning that isn’t coffee. It’s become a tradition for me in the mornings just like coffee used to be. I break down the benefits of giving up coffee, at least for a period of time, in this post. Pour milk of choice into a saucepan on the stove and heat on medium (do not boil). Add matcha green tea powder, coconut oil and hydrolyzed collagen. Whisk to combine. Pour into a blender and blend until frothy (optional, but it’s really lovely to generate that frothy top). TIP! 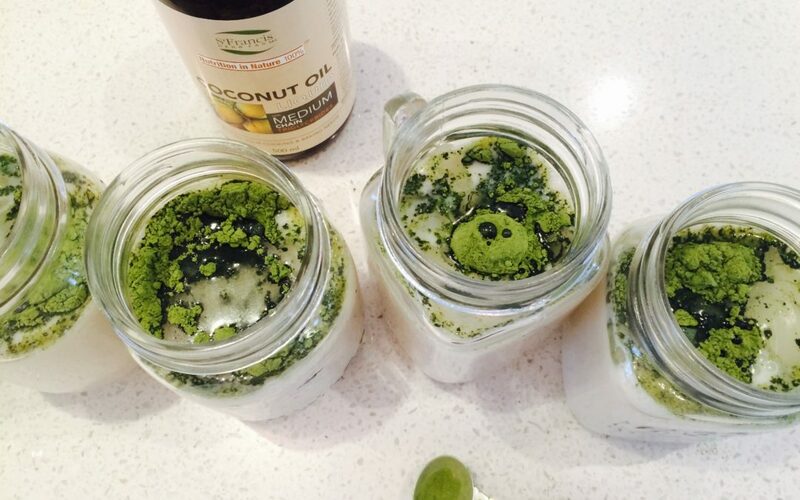 Pre-make matcha latte mason jars: add all ingredients into medium-sized mason jars and store them in the fridge. In the morning simply grab a jar, pour it into a saucepan and warm on the stove. I find that by doing this I reduce my chance of succumbing to coffee’s tempting allure! Ingredients should be organic whenever possible. Be careful of the matcha you buy: it’s wise to make sure the company you’re purchasing from has done heavy metal testing on their matcha to ensure it’s purity.